The month of October is National Bullying Prevention Awareness Month. Hopefully, you have been able to read the posts our school counselor, Jill Thomas, has been writing that provide many insights on character development. This month, at all of our Fairmont campuses, we are emphasizing acts of kindness. 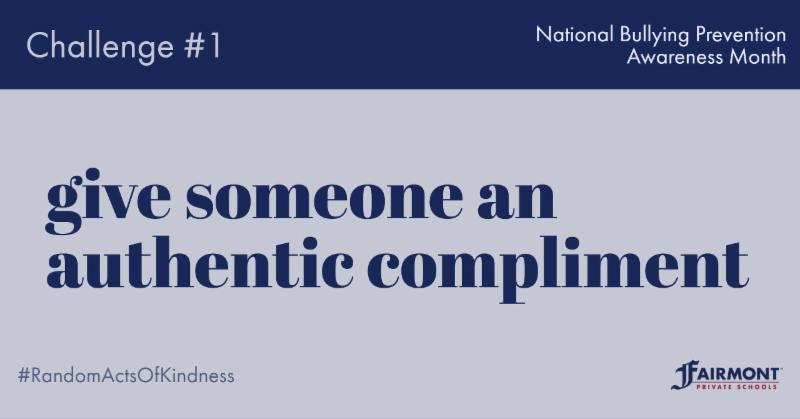 With our children, it isn’t enough simply to say “be nice.” Though we say that often as they learn to navigate relationships with their friends, as parents, we need to go one step further. We need to lead by example and model those positive behaviors for and with our little ones because it can be challenging for young children to understand feelings and their powers to initiate feelings in others. I like how you drew those details in your picture. You chose a great game for us to play. You are really good at math. Then you can teach your child how to receive a compliment politely by having him or her say “thank you” and smile. More often than not, that smile will be contagious. Follow us on Facebook, Instagram, and Twitter to view more of our weekly challenges during the month of October!